While ecommerce has taken center stage in the past decade, we still have a lot to learn from traditional brick and mortar businesses. Physical retail still makes up 90% of all purchases in North America, and is still predicted to remain well over 80% within the next five years. This post is the third in my series about top take-aways from each industry I’ve worked in that are universal truths we can apply to any industry. Everything that you do working in the corporate office of a retail company (the support center, may of them call themselves) needs to support your team of employees that deal with customers in your stores. Each and every policy can have a negative or positive impact on the customer experience, and you are relying on staff spread across the country and globe to provide a consistent and positive experience. There are so many ways to get this wrong. Every marketing effort, promotion, or policy change must be communicated in advance simply. Every communication to your field must be clear, and prioritized. You have minimal time to train and communicate with your front line staff. The majority of their time is spent doing inventory, merchandising, pretending they are having a great day and serving customers. They don’t have time to read newsletters, manuals, and sit on conference calls with you. Store employees know the customer so intimately that you would be foolish not to utilize those insights to make your operations and marketing better. They know who buys what products, they know what flies off the shelf, and they know how to sell, sell, sell. Good retailers take advantage of this knowledge and promote from within those who are good leaders, who inspire others and who can share key customer insights and tidbits to keep teams successful. No matter what your industry, you must facilitate a culture of peer support and equip your employees with all the resources they need to support the customer. When you short-change employees, it trickles down to your customers, turning their interactions negative. 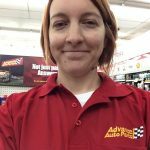 From the first week of training at Advance Auto Parts and helping out during holiday rush hours at The Body Shop, we got to experience first-hand the pressure of selling to customers, knowing the products and experiencing the wrath of the customer for a policy gone wrong. The staff went easy on us, tackling the hard problems and so we wouldn’t screw up the sale. All corporate employees need to spend a little time doing the hard work so you can understand how irritating it is to hear the store muzak, how demanding customers can be, and learn why it’s impossible to stock, put up signage, sell products, pull sales reports and coach employees at the same time. Retailers are fortunate to be closer to customers than manufacturers or etailers, but they also have unique opportunity to disappoint if service or atmosphere are not up to par. Give your corporate employees the chance to learn first-hand what it takes to serve the customer, and the chance to hear feedback verbatim from customers in the field. The only way they can identify and improve the product and experience is to empathize directly and learn about the customers’ experience. Retailers struggle with the challenge of getting feet through the doorway when mall traffic decreases. A good portion of their traffic is not purposeful, meaning these customers may not have gone out of their way to go to the store that day, they may be wandering the mall or shopping center. Your window displays and your entrance offers need to be on point to convince a wanderer to stop in. Inciting a prospect to do work in order to purchase from you is very difficult. So in addition to using your marketer’s bag of tricks, you need to make things as easy for a prospect as possible. Focusing on value-added experiences and the physical benefits of being in person (like demos) for some product categories is one way to set yourself apart. 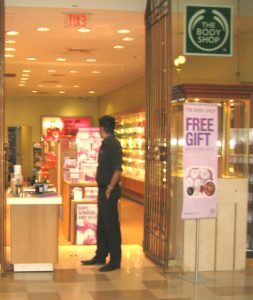 At the Body Shop we offered makeovers, used fragrance diffusers to attract smell-o-philes, and did lotion and scrub demonstrations. 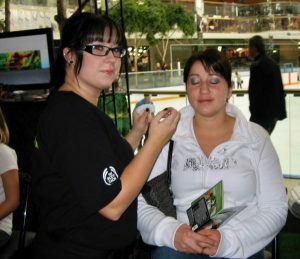 We used the loyalty program to host customer appreciation events and we even hosted traveling mall makeover tours. As technology increasingly plays in the real world and not just on a computer screen thanks to AR and VR experiences, retailers can leverage digital apps and assets to improve the customer experience in store. In the mall space, that can mean “magic” mirrors that detect your size, virtual changing rooms and fitting technology, and makeup apps! Retailers need to keep pace with digital brands and invest heavily in technology to keep up. In the non-retail world, think about how you can use immersive technology to help your sales team sell, your distribution team pack and deliver, and your service team better utilize their time. The best implementations enable employees to better serve customers, whether through AI and machine learning, data access and reporting, or simply providing instruction and organization. Driving user action is hard! Your technology should aid your customer to proceed along the customer journey, aid your prospect in making the right choices, and enable your associates to assist. The biggest learning from my time working at retailers with brick-and-mortar locations is that in order to support your customers and drive sales you also need to treat your employees as customers. Taking care of employees eases the burden on them, allowing them to do their best work in service of your customers. It also allows great ideas and insights to find their way back into your strategic plans and the writing of your brand stories. In addition, democratizing the data about customer insights and customer behavior, ensuring that it is accessible by everyone in the field, allows employees to take ownership of how they manage meeting their numbers. You shouldn’t overwhelm with too much information. Just make the most important KPIs available and let teams hold themselves accountable to success.